It’s a new day at Initial Outfitters. New products, new training, a new compensation plan and more, updates are constantly being released! In a you-centered business, work when you can, build your business to the level you desire and make a living that makes a difference in your life and in the lives of children around the world through our IO Loves philanthropy. Our personalized handbags, jewelry/gifts & home décor line offers something for everyone making it truly special! We look forward to cheering you on every step of the way. Get started for as little as $99! ABOUT US: I have been a consultant since March 2013 and I love making a living that makes a difference. Initial Outfitters offers a personalized line of jewelry, bags, gifts, home décor and more that everyone loves! Our hostess rewards are very generous which make my job easy! Our compensation plan is the best! We support a ministry called Charlie's Lunch and that is what really grabbed my heart when I joined. I love what I do with Initial Outfitters and would love to have you join me on this awesome journey! 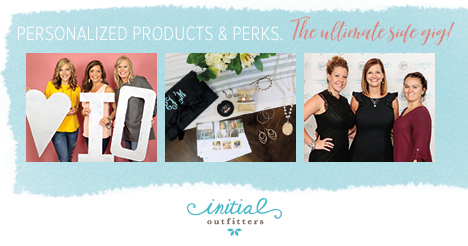 ABOUT US: Initial Outfitters is a NEW home party company specializing in Personalized Jewelry and Gifts! Our specialty boutique-like line of products is fun to shop and to sell! Not only will you be able to offer trendy new styles to the customer, you will also be able to offer something for every gift occasion! When you host a home party or catalog show there is something great in it for you!! FREE and half price jewelry and gifts. Initial Outfitters has also partnered with Charlie’s Lunch Ministries to help feed hungry children across the world. When you become an Initial Outfitters Consultant, you immediately begin earning 30% profit on everything you sell. Please call or e-mail if you are interested in seeing and sharing these fantastic products or joining my team of consultants in Southeast Mississippi. ABOUT US: I am so excited to share Initial Outfitters with you! When I came across this opportunity, seen the products, learned about Charlies Lunch I knew that I wanted to be part of this. Then I started meeting some of the other consultants, founders and home office staff. Wow, wow wow!! What a blessing I have found and my goal is to touch many lives with this business, to include yours either with the product or the opportunity! I look forward to hearing from you!